Vivekananda Kendra Assam Prant, Branch-Tinsukia organized one free eye camp on 2nd October 2015 at Sankardev Vidya Niketan of Makum in Tinsukia district. The camp was organized in collaboration with Lion K.K.Saharia Eye Hospital of Dibrugarh. 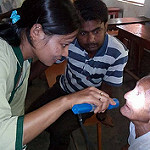 A total 123 patients were examined and 23 patients with cataract were identified. They will be operated free of cost. On 4th October 2015 a medical camp was organized at Lakhipather village of Digboi by our mobile medical team. 192 patients were examined by the Doctors team and free medicines were provided to the needy patients. Dr.S.D.Singh a physiotherapist from Tinsukia also accompanied our team and did pain management for the elderly patients.